I've been trying to figure out how to talk about this and not come across as a gushing, ridiculous fanboy and it's much harder than I would have imagined. Especially when I consider the fact that it wasn't until it was coming back that I had really realized how much I had missed Stray Bullets. But sometimes life is like that. David Lapham's Stray Bullets hit me at what must have been just about the perfect time. Because when I finally gave it a day in court I couldn't stop reading it. I devoured it. It started with the second hardcover collection "Somewhere Out West" which begins with the second half of a story that had started in the first hardcover "The Innocence of Nihilism" and even with that being the case I could not possibly have cared less. I loved being dumped down into the middle of a story that was so crazy that I couldn't help but be locked in. 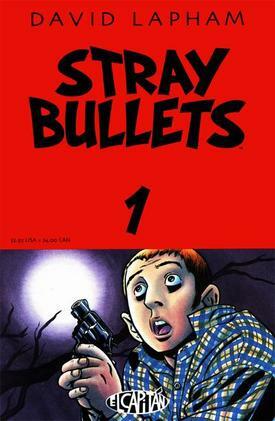 I had often heard of Stray Bullets being spoken in the same breath as Strangers in Paradise, Eightball, Black Hole, Optic Nerve, and many of the other incredible independent black and white comics of the 90s that were starting to get collected during the early 2000s and as a result were becoming more available. 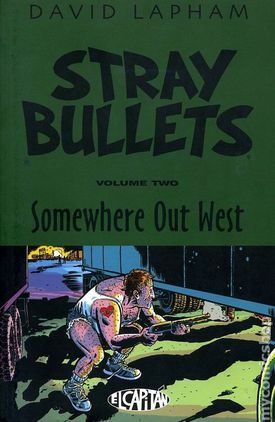 Stray Bullets was a unique story in that it was a period piece (set mostly in the 1970s) as well as being darkly twisted noir that lingered more in the world of suburbia than of the dark underbelly of the world of crime. Lapham had experience in the world of comics prior to setting out on his own and creating Stray Bullets having worked on several books as an artist for comics written by Jim Shooter at Valiant Comics (most notably Harbinger) in the early 90s as well as some books at Defiant Comics (most notably Warriors of Plasm). His art style lends itself to the gritty content of both the books he had done previously as well as the work he began crafting in Stray Bullets. And in 2005 it ended ... the siren call of making money enough to support his family wound up being too strong to resist and he left his creation behind for work from Marvel (Daredevil vs. Punisher, Terror, Inc., Spider-Man: With Great Power, DeadpoolMAX, and Age of Apocalypse) & DC (Detective Comics & Tales of the Unexpected), Vertigo (Young Liars, Fables, Silverfish, American Splendor) as well as Top Cow (The Darkness) and others additionally working quite a bit for Avatar Press (on titles like Crossed, Caligula, Ferals, and Dan, The Unharmable). But finally, after more than 8 years of waiting we loyal fans will finally get the return of the book we've all loved and been waiting for. Stray Bullets returns. And it doesn't just return one issue at a time. Oh, no. It comes back with a colossal bang. The long awaited issue #41 hits the shelves with the first issue of an all new story: Stray Bullets: Killers #1. AND!, AND!, The Stray Bullets: Uber Alles Trade Paperback which collects all 41 published issues all in one book! The time has come friends. The time has come to once again stare deeply into the dark abyss where the human heart usually resides and let the despair of everyday life at it's most grim and desperate. The time has come to once again come to grips with the simple things that can take life down a dark path ... the extra curricular activities of teenagers, the secret lives of housewives, and the poor decisions of average businessmen. The time has come to return to the pages of Stray Bullets.